Samsung Note 9 the next anticipating phone from Samsung has been appeared with Snapdragon 845 processor appeared in Geekbench.The phablet phone is expected to launch mid 2018 with indisplay finger print scanner slong with face unlock system.However,look at the picture and see the features of upcoming Note9. 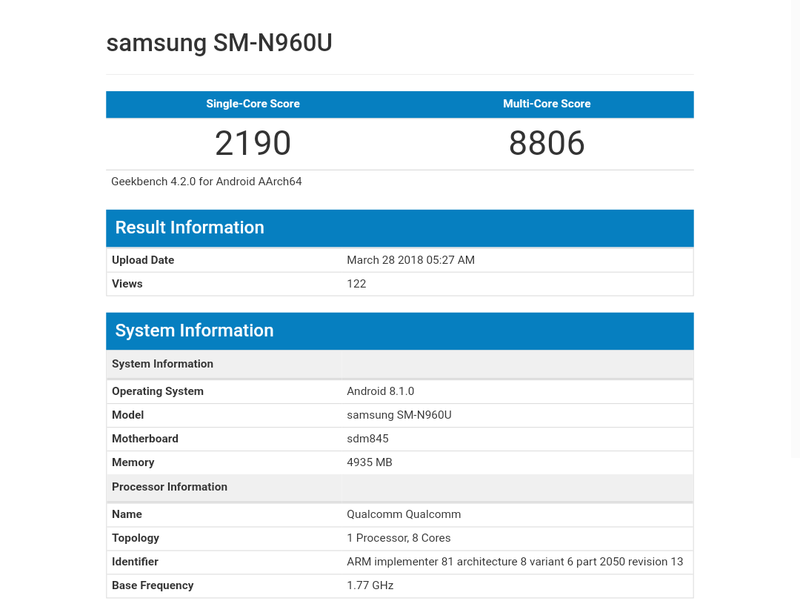 As expected,it will come 1.77 GHz Snapdragon 845 octa core processor with 6 GB RAM.It is speculated to have a 8 GB RAM variant too.However,it tested with Android 8.1.0 Oreo.With this features,it scored 2190 and 8806 on single and multi core tests respectively.The scores are lower than recently launched Samsung S9 plus which holds 3773 and 9024 on single and multi core tests respectively. However,the phablet may come with variable aperture dual camera set up like S9 plus.It may have 6.3 inch size in display with AMOLED panel and QHD plus resolution.Though its key features revealed in Geekbench,other specifications are not confirmed.